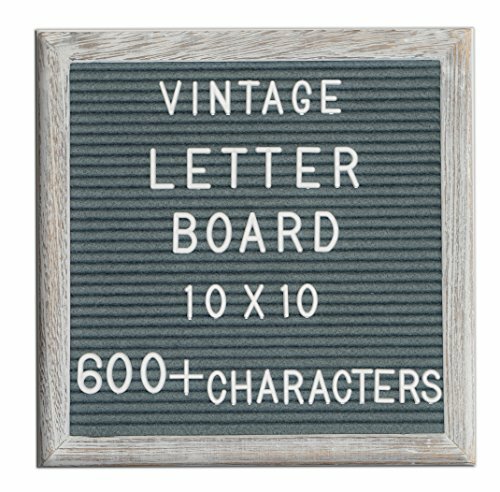 ► Vintage 10 x 10-inch wooden frame letter board kit. This Letter Board kit includes one dark grey vintage style 10 x 10-inch gray felt letter board. 360, 3/4-inch, small white plastic letters and punctuation symbols. As well as 256 1-inch larger letters. The 10 x 10-inch gray felt letter boards are the perfect accent piece for any home, business or event space. ► Versatile and classic! These letter boards are the perfect canvas. Reminiscent of a simpler time, our letter boards are making old things new again. Remember back to a time of menu displays at greasy diners, drive- ins, and the corner coffee shop, daily matinee listings at your neighborhood movie theatre, or the window display at a cozy bookstore. Great for quotes, memes, catchy sayings, verses, milestone events, baby showers, announcements, first day of school, wi-fi passwords, daily reminders, photography props, kitchen menus, chore list, signage for small businesses, weddings, and game-night leaderboards! Whether insightful, motivational or even a little sarcastic, your words will accent your home in a personal and meaningful way. ► Two sets of letter sizes. Each kit will include 360 3/4-inch letters as well as 256 1-inch letters. Use these together to create visual emphasis. ► Use on social media. The perfect social media tool to make your images stand out! The original way to share. Turn every picture into a meme! ► Perfect as a gift! Give one to those who love to personalize their homes or offices. Ideal for poets, authors, comedians, aspiring/actual social media stars and anyone with a love for word-play. Our beautiful packaging is ready to gift as is. ►Retrominded is a small American owned company. At Retrominded we specialize in timeless products that never go out of style. All of our products are made with the highest quality materials and love. Lots of love. ELEGANT, VINTAGE & RETRO - Add captions to your photos, style to your home, and language to your life! The many uses for our letter boards are limited only by your imagination. ADD EMPHASIS- Multiple letter sizes give your phrases variety! Use our large 1" 256-piece Character Set along with the standard 360-piece ¾" Character Set when you need certain words to stand out. HIGHEST QUALITY - Our 10in x 10in letter boards are made with premium distressed wooden frames and hand-crafted dark gray felt. Frame your best sayings, quotes, and phrases. Give your words a look and style from a bygone era. No batteries required. MAKES A GREAT GIFT- A great addition to any home or office! Perfect for old souls and young minds! 100% satisfaction guaranteed. CANVAS BAG INCLUDED- Never lose a letter with our drawstring equipped canvas pouch! If you have any questions about this product by Retrominded, contact us by completing and submitting the form below. If you are looking for a specif part number, please include it with your message.